Ben Sira: Sententiae morales Ben Syrae... Tobias Hebraice vt is Adhvc Hodie Apvd Ivdaeos Invenitur, Omnia ex Hebraeo in Latinum Translata, in Gratiam Studisorum Linguqe Sanctae, per Pavlvm Fagivm. 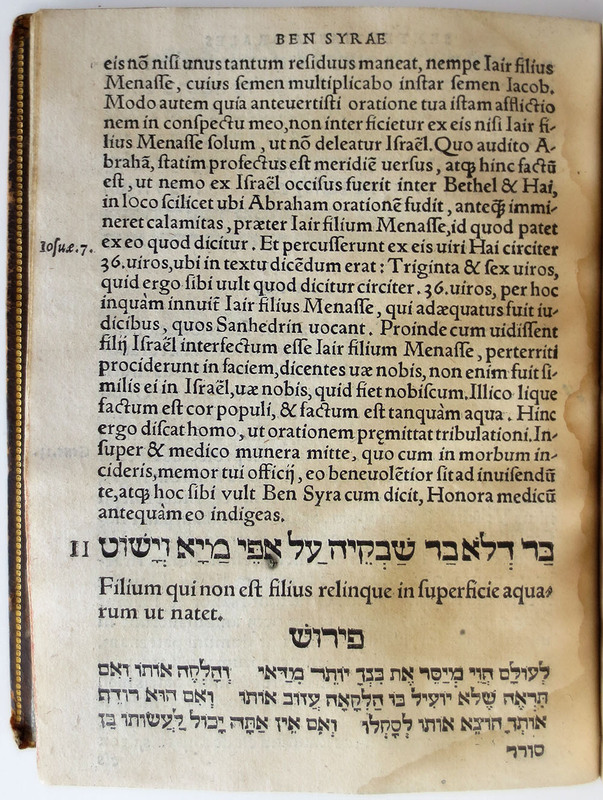 One of the longest books of the Bible, Ben Sira was originally a religious text setting out wisdom, moral maxims, and codes of behavior for the Alexandrian Jewish community. Part of the Apocrypha, or Roman Catholic Deuteronomical books, it is one of the fifteen books from the pre-Christian period that are accepted as canonical scripture by the Roman Catholic Church. This work is representative of the return to the original texts, and a subsequent rapprochement between Jewish and Christian religious textual traditions.